This Tempe AZ Handyman rescues Do It Yourself home improvement projects that have been started and now need a little help to get finished. So you thought you could replace the bath room vanity or install a new door and things have gotten a little complicated. I can help un-complicate things and get your DYI projects finished. The DYI Channel is one of my most valued sources of work. If you have a project started and can’t finish, call this Tempe Handyman at (480) 232-7689 and I will gladly finish the project and make you look good. 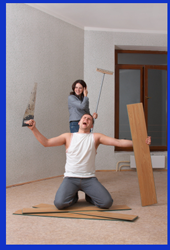 Tempe Handyman Services for DIY Rescue Include . . . Some of my other Tempe Handyman Services include . . .